A version of this article appeared in the Winter 2012 edition of Winescope. Winescope is the official newsletter of the Winemakers’ Federation of Australia, ‘produced twice a year and distributed in hard copy to all Australian wineries and other stakeholders.’ I thought it would be fun to share a bit of my work life, as Online Communications Advisor for Wine Australia. If you have any questions, comments or criticism chuck them in comments and I’ll get back to you ASAP. Social media has been creating a great buzz in the wine industry in the last couple of years. Twitter, Facebook, LinkedIn and YouTube are rapidly becoming standard tools of the trade for getting key messages to an online audience. communicate the story of the quality, value and diversity of Australian wine to trade, media, influencers and consumers. provide a platform to collect and analyse data on social media activity relating to the Australian wine industry, including audience demographics and sentiment analysis. The strategy focused on using appropriate social media platforms to increase engagement and ensure the message reached the appropriate audience. One of the key outcomes of this was the deletion of the Wine Australia ‘branded’ Facebook fan page. This was done as research showed that Facebook isn’t the location that people are searching for industry news and announcements. To complement more traditional communication channels the Wine Australia Twitter account is used for key announcements, updates on market programs/international visitors and to spread positive news about Australian wine from influencers and media. In the coming months, we will also expand Wine Australia’s presence on LinkedIn as this has been identified as a useful tool for networking and sharing knowledge with people within the wine industry. For our consumer/trade/media directed engagement and communication under the A+ Australian Wine banner, the strategy initially focused on spending an equal amount of time utilising Facebook and Twitter. Over the past year, as a result of the research detailed later, we’ve adjusted our focus to ensure we are using the right platforms for the audience we are targeting. The result is that we have moved our focus to Facebook and YouTube for consumer engagement while utilising Twitter for the majority of our trade, media and influencer engagement. Another key focus of the strategy is to listen to the online chatter about Australian wine. From a consumer, trade, media and influencer perspective this allows Wine Australia to identify and spread positive messages about Australian wine quickly and efficiently. Examples of this include sharing the recent increase in positive press about Australian wine in North America and the great reaction online to the renewed Australian wine industry presence at Prowein. This message was shared to our audience, many then shared this positive messaging to their audiences. Listening to online chatter allows Wine Australia to gauge industry and stakeholder reaction to announcements, and this feedback is reviewed and taken on board. Before, during and after the recent changes to the Wine Export Approval Panel process we were able to listen to what was being said and respond to questions or queries as required. Key media, trade and influencers discussing the issues around the changes were identified and directly responded to with correct information about the changes to the process. An example of this was a wine writer in the UK, who initially expressed reservations about the changes. After engaging with him on Twitter and providing with detail he was fully supportive and ended up writing two articles which implored similar organisations in other countries to follow Wine Australia’s lead. 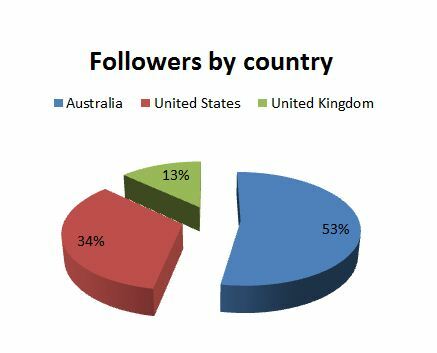 For Wine Australia, Twitter is the most widely used corporate social media platform. 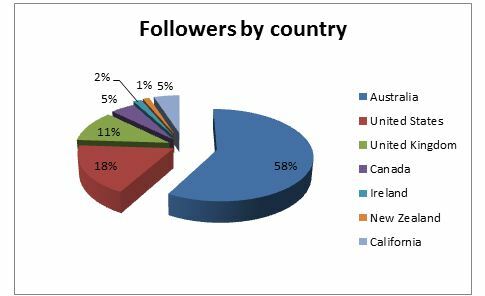 Analysis of the Wine Australia Twitter account shows that followers are mainly confined to industry/Trade/media, with more than half in Australia and the rest in our traditional export markets, the US and the UK. What did surprise us, however, was that despite efforts to obtain a strong consumer audience with the @apluswines account, the picture is similar. 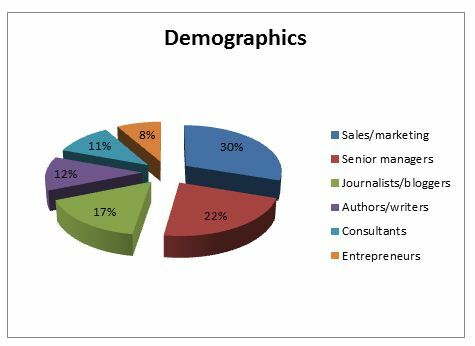 As the chartss below illustrate, while geographic spread is wider for this account, the vast majority of the audience could still be classified as industry/trade/media. So does this just mean that we are just “talking amongst ourselves” on Twitter in the wine industry? At the very least, it’s impossible to deny that there is an element of this occurring on Twitter, but that’s not necessarily a bad thing. The research shows that Twitter is a great platform for networking, engaging with wine media/influencers/buyers/suppliers and discussing the pertinent issues for the industry. If that is what you are using Twitter for then it is an elegant, powerful and highly recommended tool. However, if you are attempting to use Twitter as an online platform to engage and attract new consumers then right now then your efforts may be best directed elsewhere. Facebook offers a larger potential audience of consumers, as well as the tools (video/images/apps) to attract them to your brand/business and engage with them. So what can we take away from this analysis? 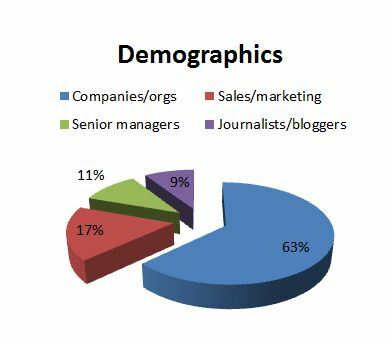 Simply, defining your target audience and focusing on how to communicate with that audience is more important than ever. Many in the industry have achieved great success over many years by using the right tools to get the right message to the right people. Social media is here to help all of us do what we’ve always been doing, albeit in a more targeted, focused and cost effective manner. This, overwhelmingly, is my impression of how people in the wine industry tend to use Internet social networks: they use Internet social networks to talk to each other about each other, and they use them to ensure that they’re SEEN talking to each other about each other. I’ve described it as being like walking into an establishment and finding all the staff standing behind the bar… but with their backs to the door, highfiving each other while loudly proclaiming “YOU’RE AWESOME” “NO YOU’RE AWESOME” “MAN, IT’S SO AWESOME THAT WE’RE AWESOME” while I stand there, thirsty, with my wallet in my hand, being totally ignored. Cheers for the comment, hope that (in the medium to long term) social media can assist in the democratisation of wine. Currently, despite the gallant efforts of a few, social media is a reflection of what ‘real people’ (non-industry types) already think about majority of people in the wine game. Those that succeed in removing elitism and snobbery will reap great rewards.